The Moon will pass through the Earth's shadow between 06:15 and 09:51 EDT, creating a penumbral lunar eclipse. The eclipse will be visible any location where the Moon is above the horizon at the time, including from Oceania, the Americas, Asia and French Southern Territories. Maximum eclipse will occur at 08:04 (all times given in Fairfield time). Like other lunar eclipses, penumbral eclipses occur whenever the Earth passes between the Moon and Sun, such that it obscures the Sun's light and casts a shadow onto the Moon's surface. But unlike other kinds of eclipses, they are extremely subtle events to observe. In a penumbral eclipse the Moon passes through an outer region of the Earth's shadow called the penumbra. 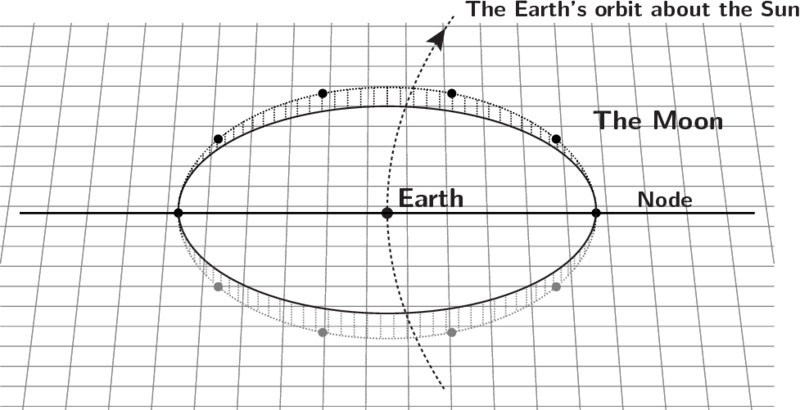 This is the outer part of the Earth's shadow, in which the Earth appears to cover part of the Sun's disk, but not all of it (see diagram below). As a result, the Moon's brightness will begin to dim, as it is less strongly illuminated by the Sun, but the whole of the Sun's disk will remain illuminated to some degree. Although the Moon's light dims considerably during a penumbral eclipse, this is only perceptible to those with very astute vision, or in carefully controlled photographs. On this occasion 68% of the Moon's face will pass within the Earth's penumbra at the moment of greatest eclipse, and so a modest reduction in the Moon's brightness may be perceptible. 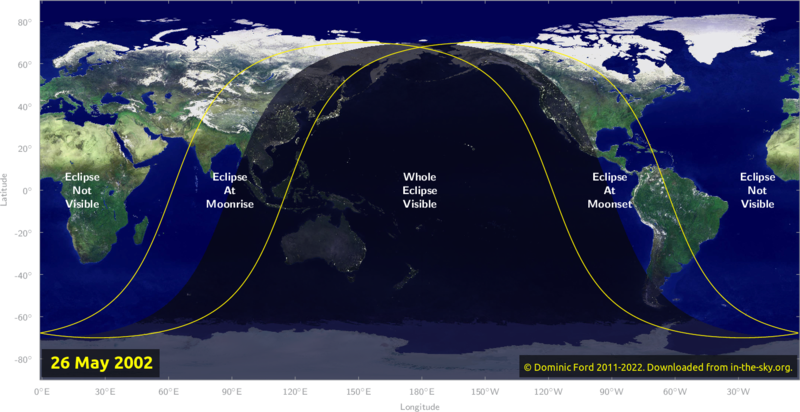 The map below shows where the eclipse of May 26 will be visible. Map of where the eclipse of May 2002 will be visible. Click here to expand. The Moon 16h13m -19°59' Scorpius 32'16"